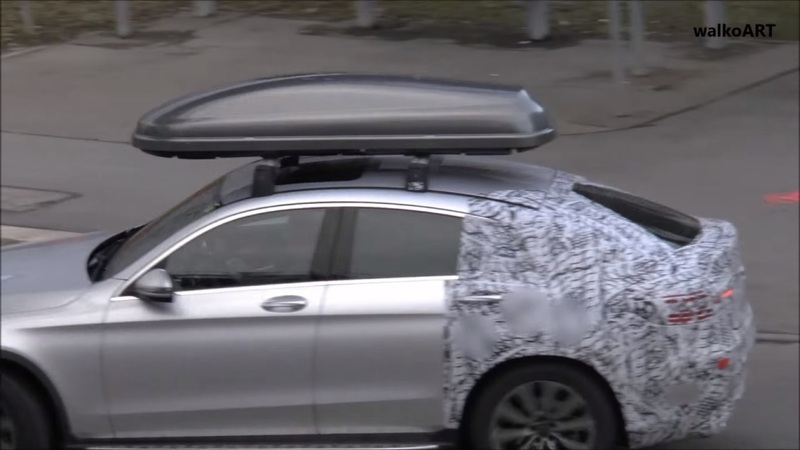 A prototype of the Mercedes GLC Coupe was spotted again, as show on a report from worldcarfans.com. 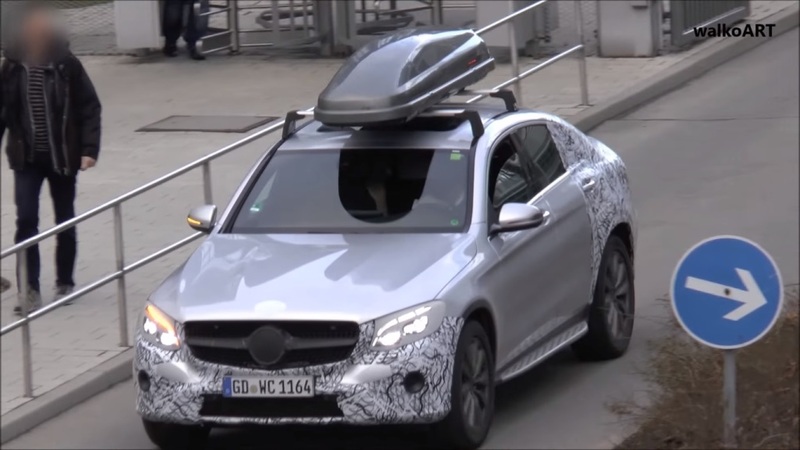 Aside from its camouflage, the GLC Coupe also sported a roof box as it went through final testing. The new spy video shows the luxury vehicle about to be transformed by the German company into a crossover coupe to go up against the X4 of BMW. While the GLC is given a profile similar to a coupe with its more inclined roof, the headroom at the rear will become smaller along with its trunk capacity. This makes the GLC less functional. When the rear seats of a standard model of the GLC are used, it has a total space of 19.3 cubic feet or 550 liters. If the seats at the rear are folded, it can offer a total of 56.5 cubic feet or 1,600 liters of space. While the space of the new Mercedes GLC Coupe will go down, this reduction in space may not matter for people who want to own the vehicle mainly for the status it offers. The video of the prototype shows the capacity of the trunk was inadequate. This particular prototype was spotted with a roof box as it went through the final stages of testing. 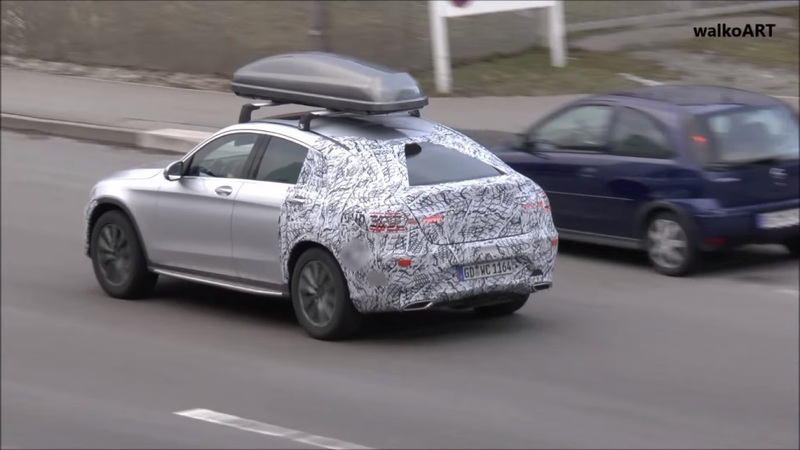 Since the camouflage of the vehicle is expected to be removed, it is possible for the Mercedes GLC Coupe to be officially launched during the Geneva Motor Show. The new GLC Coupe is expected to be similar to the Concept GLC Coupe, which was unveiled a year ago. The Mercedes-AMG FLC 43 Coupe will be the best versions of the vehicle it features a six-cylinder 3.0-liter engine offering 362 HP of power. While the Mercedes-AMG GLC 63 Coupe is expected to be released in 2017. It will feature a 4.0liter twin-turbo V8 engine offering 503 HP of power. While the F-Cell version of the GLC was already announced by Mercedes, it remains uncertain whether a hydrogen fuel model will also be offered under the Mercedes GLC Coupe guise.